Before Morgan was born, we ordered a variety of wall decals to put up in her room. Unfortunately, there was a problem with the supplier, so the decals were never shipped and her walls remain bereft and artless. I am planning to order this Mondrian-style decal to go above the dresser. I'd also like some posters for the other walls, but I'm having a hard time thinking of what exactly. 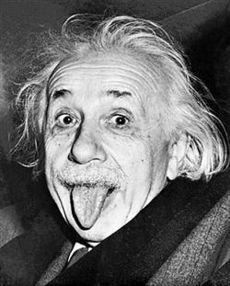 I think nice big portraits of people who are good role models and also visually interesting would be perfect, but I'm not sure who that would be, other than Albert Einstein. Help me brainstorm! Who are some visually interesting positive role models, especially female ones? Bonus points if you can identify a source for large cheap portrait posters. sorry--i was having too much fun. i have no idea where to get the posters, though! Oh yeah, Frida Kahlo totally wins the interesting-looking sweepstakes! I grew up near the Babe Didrickson Zaharias Museum. That is an awesome picture of Marie Curie. Hmm, yeah, the Hope Obama poster could be cool. I had a great set of posters of interesting people of color on my office wall in 2000; wish I knew what happened to them. So many were visually interesting including Frederick Douglass (knockout), Madam CJ Walker, and more. Also the American Library Association has bright-colored reading posters, some of which are portraits. I grew up with Mondrian on my wall, so your choice makes me happy. I had some ALA posters when I was a preteen -- that's a great idea, I bet they have some neat people. I recently ran across this, which I would love for my own wall if I were a poster-posting person (sadly, not). How long do you intend to keep these posters up? It might be worthwhile to use your famous role models when she's a small-to-medium sprout and you can talk with her about who these people are. I'm not really planning to redecorate until she's old enough to have an opinion about how it's done... and possibly also not until she can safely use a lofted or bunk bed, because I have no clue how to fit a desk in that room without lofting something, and it seems silly to go to a lot of effort before then. Those are very pretty; I like the style. Hey, I have a decal set that you can make a tree with. After I ordered it, I decided it's more complicated than I want to deal with. If you want it, I'll figure out a way to get it to you.